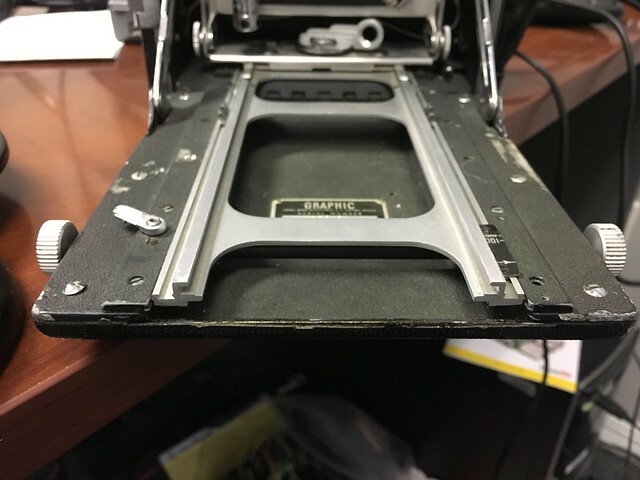 I recently purchased a 4x5 Speed Graphic and the metal strip on the bed that hooks onto the latch to keep the front bed closed is missing. Does anyone have any idea where I could find a replacement part or a suggestion on what I could use instead of the metal strip? eBay has a handful of replacements for the top latch, but none for the bottom part. If this has already addressed can you point me in the right direction? I couldn't find anything through searching the forum. Are you sure a piece is missing? The bed or case section may be bent enough to prevent them from engaging. I'm not 100% certain. As far as I can tell there is nothing on the bed currently that looks like it could connect to the latch (I don't see anything that looks like it could be bent to connect to the latch unfortunately either). 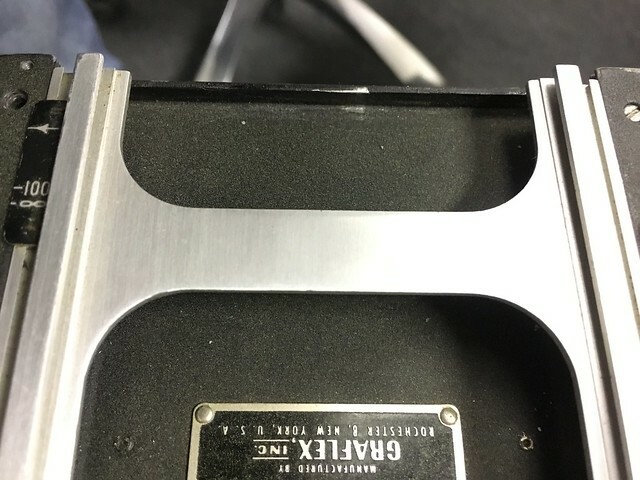 This made me look at my Crown Graphic which has that silver strip and to my eye it appears as if this is the missing piece. I'll try to post a few pictures of the Speed Graphic's bed later to see if this really is the case or if I don't know what I am looking for to bend back into place. The service manuals I have access to are photo copies of the original. There is a Catch-Bed and a Rivet shown to be front center of the bed. Common failures in the past have been the case part bend down so that it would not engage the bed catch or the angled lip of the case latch bent outward so that it would not hook onto the bed catch. I do not have a Pacemaker Graphic, I do have a Pre Anniversary and a Miniature Speed which use a similar latch system. Am I missing something from the images? I still don't see a catch attached to the bed which makes me think I'm missing the silver metal part. Yep, you found the problem allright. On my Century, that metal strip serves as the lip which holds the spring metal catch; without it, there's nothing to secure the front door in the closed position. Thanks, guess I'll see what I can do to fashion a lip for the clasp.